Is something missing from your life – and do you know what it is? Nine artists unravel their understanding and interpretations of everyday ‘absence’ until July 3, at Alibi, a group exhibition at the Linda Gallery, 798 Art District in Beijing. By the entrance protrudes a branch on a spring. The artist, Yang Xinguang, was inspired by his experience climbing a mountain. To enter the gallery, visitors have to either push the branch away to clear a path or make a detour. “The attitude of both accepting and escaping from the disturbance embodies our resistance against something that should have not shown up in our lives,” Yang explained. Inside, you’ll find a wall stocked with hundreds of half-eggshells, inside each of which has been written dense and repetitive English vocabulary. Looking for Sense of Security is about artist Liu Ren’s complicated feelings about the language as a required course in his past educational experience. Another of Liu’s works, Back to Ashes, an aluminum lunch box filled with eggshell debris, is more nihilistic. “A living man can disappear in a blink, together with all his sentiments. Consequently, what he thinks important is no longer meaningful, just like the words in the shells. No matter how significant the messages were, time will at last dissolve all existing things,” Liu explained. Besides Liu’s artworks, there are 10 oil paintings, five each by Sun Daliang and Shi Wenfei, Role, a video installation by Li Ming, Tian Yu’s multi-material Shield Position and Li Wei’s action-art video 22 min, 55 sec. Wu Xiaojun’s work, based on Saddam Hussein’s last words. 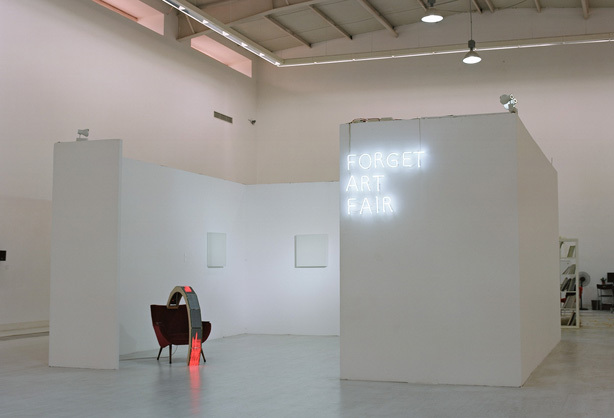 In a separate space with a white neon-light fascia is the Forget Art Fair, a specifically showcased “mini-fair” at the center of the gallery. “It is a mini-sized art fair with only one booth,” Wang said. “Which tries to extend the conception and function of traditional art fairs in a limited area. “Contemporary Chinese art strongly requires the platform of commercial galleries. Forget Art Fair not only represents this status quo but attempts to blur the boundaries between commercial intervention and experimental presentation,” she continued. Forget Art is a group comprising several dynamic young artists. Based in Beijing since 2009, it has successfully participated in two exhibitions. “We are trying to develop work which is not easy to categorize. With a strategy of ‘urban nomad tactics,’ we are attempting to redefine spaces and locations,” said founder Ma Yongfeng. Seven artworks are showcased at Forget’s Linda exhibition, including Alessandro Rolandi’s One, Huang Jia’sJanuary 2011 and February 2011, Ma Yongfeng’s Transparency is Wrong, Wu Xiaojun’s Don’t be Afraid and Yang Jian’s Want to Leave, using materials from oil-on-canvas and stainless steel to 3D animation, neon lights, synthetic glass and LEDs. “Wu Xiaojun is an important figure in the conceptual photography movement of the 1990s, when he fabricated fictional cartoon figures and scenarios,” art critic Carol Yinghua Lu said. Lu was one of five judges at the recent Golden Lion Prize in the 54th Venice Biennale, Italy, and the only Chinese curator of the 2012 Gwangju Biennale, South Korea. 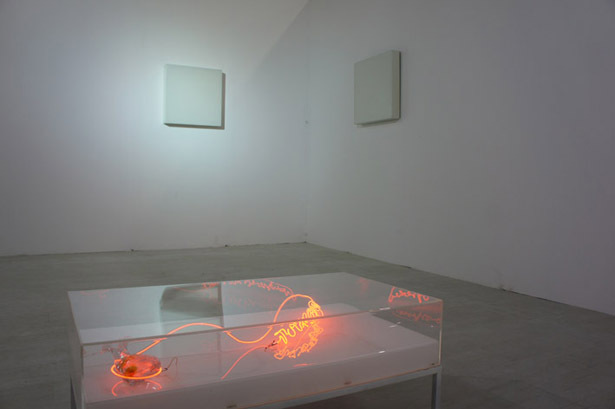 Wu’s Don’t be Afraid features a heart-shaped object from which blood vessels made of thin red-neon lights extends, shaping the letters of Saddam Hussein’s last three words before his execution in December 2006 – and the title of the work. “Since 2000, Wu has shifted the focus of his practice toward making site-specific neon-light installations, often involving texts and words, to comment on political and social events,” Lu noted. “Based on his previous experience as a news editor, Wu is able to place an event that has taken place or is happening, in a logical perspective and a larger historical context.